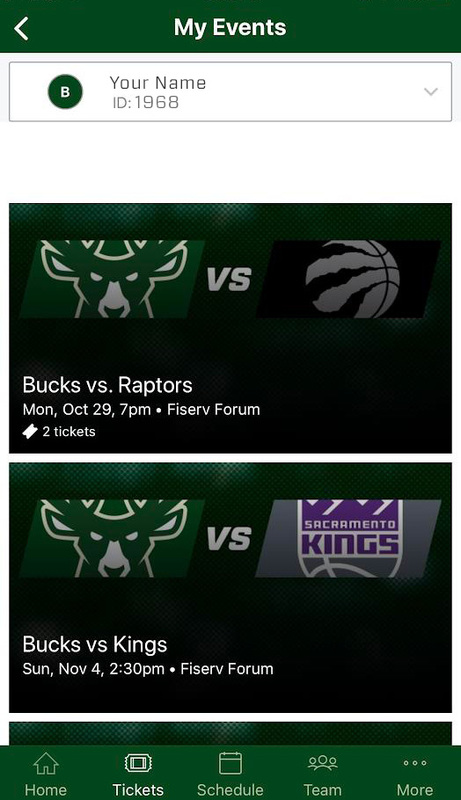 To access your mobile tickets, download the latest version of the Milwaukee Bucks App. Open your Bucks App and click on the "Tickets" tab on the bottom. Tap "Manage My Tickets" to access your account. 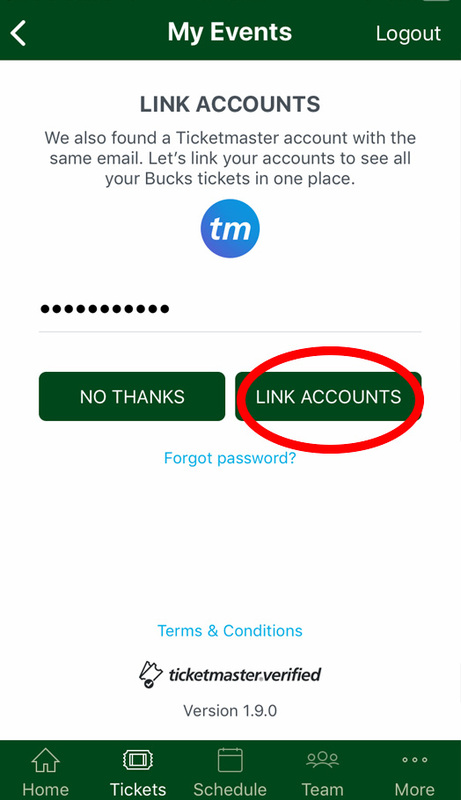 Login to your Bucks Account (Email and Password). If you don't remember it tap "Forgot Password?" for instructions to reset your password. My Events is where you can access and manage your tickets to all your events. Click on the event you would like to manage. For this example, we will use a Bucks game versus the Raptors. Follow steps 1-7 above to nagivate to the event you want to transfer. Tap "Send" at the bottom of the screen to transfer your tickets to an email address or phone number. 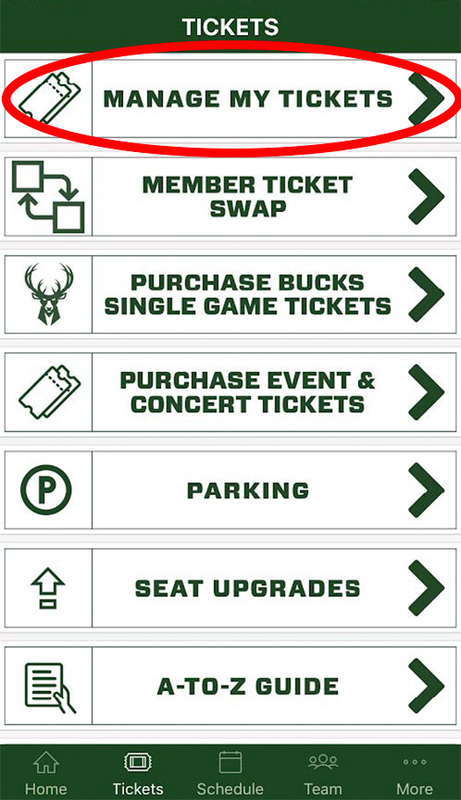 Why are the Milwaukee Bucks moving to digital tickets? The app and mobile ticketing are FREE. 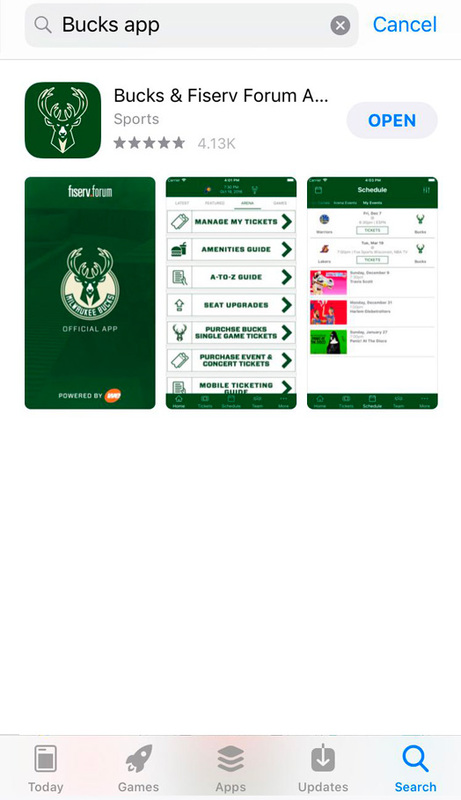 There are no costs associated with managing your tickets via the Official Milwaukee Bucks App or using Account Manager on your smartphone, including accessing tickets for mobile entry, forwarding tickets or selling tickets online. 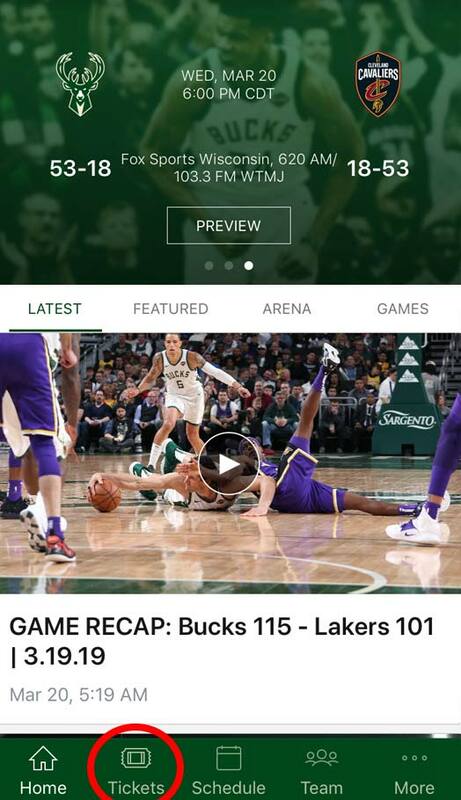 Download the Official Milwaukee Bucks App from the iTunes App Store or the Google Play Store. Go to “Tickets” or “Manage Tickets.” Browse for the specific event you’re looking for and top to see your tickets. 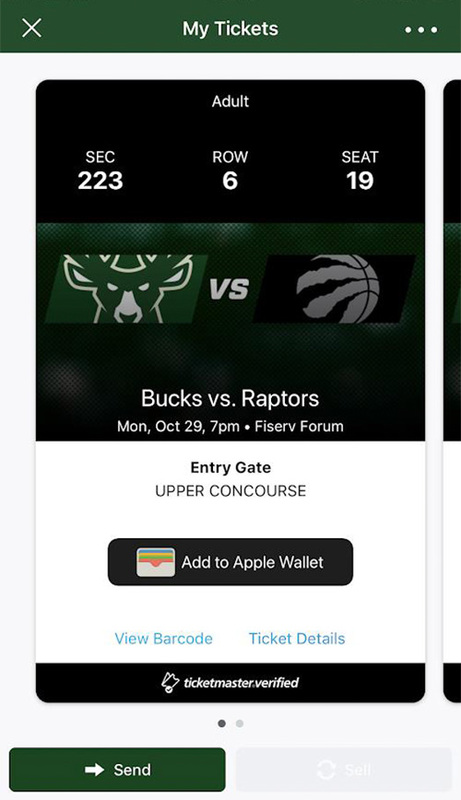 When you get to Fiserv Forum, present your smartphone to the guest services representative to have your ticket scanned, or scan it yourself at a scanning station. If you have guests and multiple tickets on your phone, swipe to navigate between them. Can I print my tickets from home? No. This year, all tickets are fully digital and only accessible via your mobile device. Your phone is your ticket. No. a mobile ticket must be provided either with the app, the mobile website or within your phone’s wallet to gain entry into Fiserv Forum. What happens if my ticket doesn’t scan properly? That can usually be solved by turning your screen brightness to the highest setting. If that doesn’t work, your ticket can be validated by having the ticket taker manually enter your ticket number directly into the scanner. What if I lose connectivity/can’t connect to my account at Fiserv Forum? Our team app includes offline mode so once the tickets have been added to your account, you will be able to access them regardless of internet connectivity. To ensure seamless entry, we highly recommend downloading your tickets to your phone before arriving to the game. If you have an iPhone, you can store your tickets in your Apple Wallet. If you’re an Android user, you can save your tickets to your phone through Google Pay (formerly known as Android Pay). When should I download my ticket? We recommend that you download your tickets at least 24 hours before the event. What if my phone breaks, dies, or is lost/stolen before I arrive? Simply come to the box office, present your ID and we’ll print your tickets for you. Yes; however, it’s much easier to send each attendee their individual ticket. You can easily send each member their ticket individually since each person entering will need a ticket to get in. Does the person I send the tickets to need a Ticketmaster account? Yes. If they don’t have one already, they will create one in the acceptance process. Yes, you can reclaim tickets as long as they haven’t been accepted by the recipient. Can ticket holders transfer tickets after the event has started? Yes; however, you cannot sell tickets after the event has begun. Our venue is PCI compliant, giving you the highest available security to ensure that your credit card, driver’s license, and account password are all well protected. Account Manager gives you the ability to easily manage your tickets whether you want to view, send, resell or donate your tickets to charity. What is the difference between the new and previous version of Account Manager? Account Manager has been completely redesigned, making it easier than ever to manage your tickets. Now you can quickly navigate the homepage, manage your tickets, and pay your invoices both online and from any mobile device. Use the same email address and password that you used to log in to the previous version. 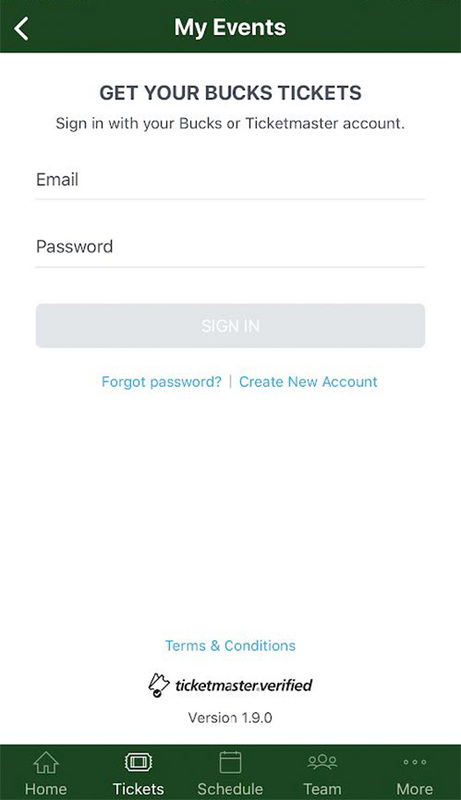 You can log in from your mobile device or desktop. Please note that you can no longer log in with your account number. How do I pay invoices?